You call them LEFTOVERS, I call them RECIPE SHORTCUTS. My MIL gave us the meat from two chickens (she made homemade chicken soup and this was the meat that came off the bones) and about 10 medium sized roasted sweet potatoes. I spent this morning talking with my bestfriendGoogle about how to repurpose said sweet potatoes. I thought about Gnocchi – I explored recipes ranging from Mario Batali to Marcella Hazan. I thought about Kugel – but the idea of cooking MORE pasta seemed annoying, so I bypassed that. I thought about making sweet potato ravioli – but the idea of clarifying butter and using the dried sage I happen to have on hand – also annoying. I do have some chinese dumpling wrappers in the freezer that I could use… maybe sweet potato + cream cheese filling and then fried? *sigh* I’m sure it’d be delicious, but the idea of frying….. Not today. Finally, I decided to look up shepherd’s pie – that’s a good use for leftover potatoes, why not sub in SWEET potatoes? That could work. That could TOTALLY work, right? My bestfriendGoogle offered Alton Brown’s recipe. 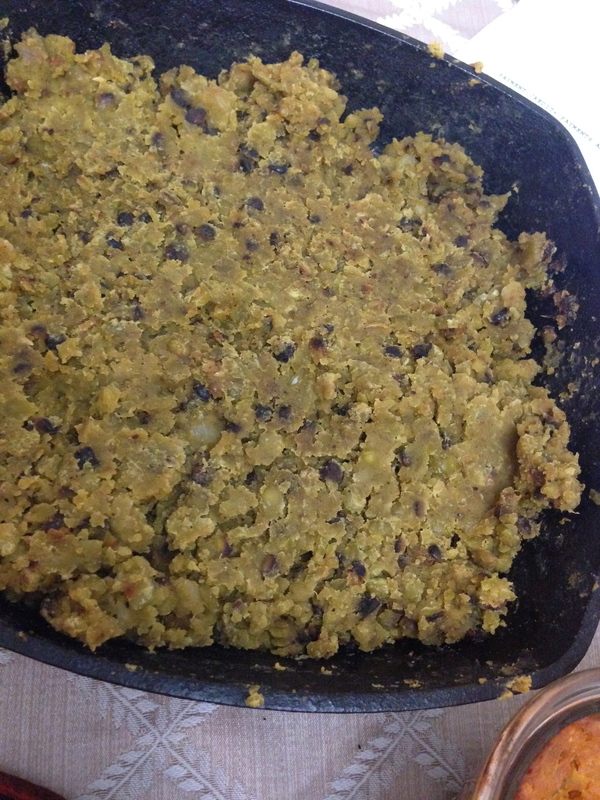 Yes, Yes, I know that traditional Sherpherd’s Pie is made with ground lamb, but but – I have stewed chicken on hand! Oh, and I don’t have peas. OMIT. Okay, so I swapped out a few things. 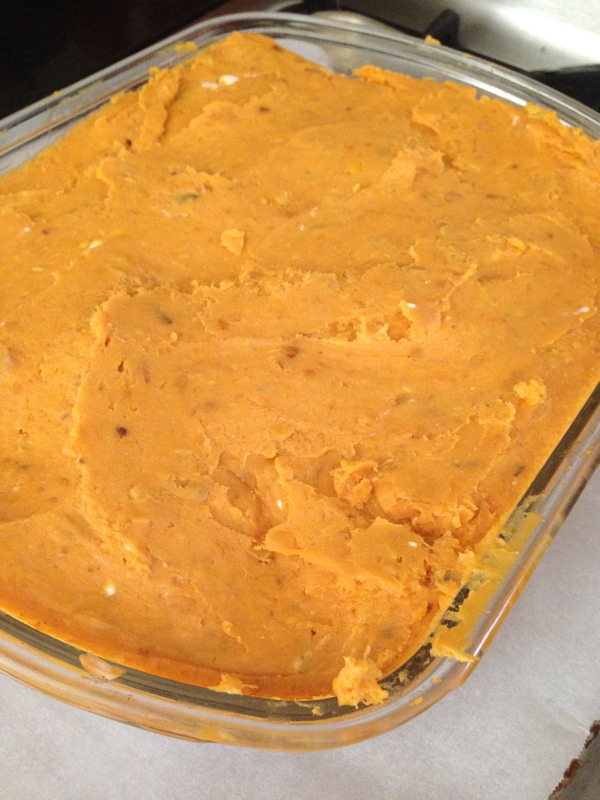 I skinned and mashed the sweet potatoes, then mashed in 2T of non-dairy margarine (Earth’s Best), 2T of non-dairy cream cheese (Tofutti), and a little more than 1/4 Cup of unsweetened Almond Milk (instead of the suggested half-and-half). I sautéed one diced onion and 2 diced carrots in some leftover ‘bacon’ fat (Beef Fry), added in the minced garlic (Dorot), threw in the diced chicken pieces and heated through. Then I sprinkled 2T of some flour – OOH OOH! I subbed in Whole Wheat Flour instead of traditional White. Tossed to coat, then I poured in tomato paste, worcestershire, chicken stock, rosemary and thyme – Uh Oh. Sub #3 – I used dried, not fresh. WAIT – that totally doesn’t count. I take it back. Where was I? Oh yeah. So I brought it to a boil, and let it simmer til it thickened a little, then I added in the corn from a fresh cob. 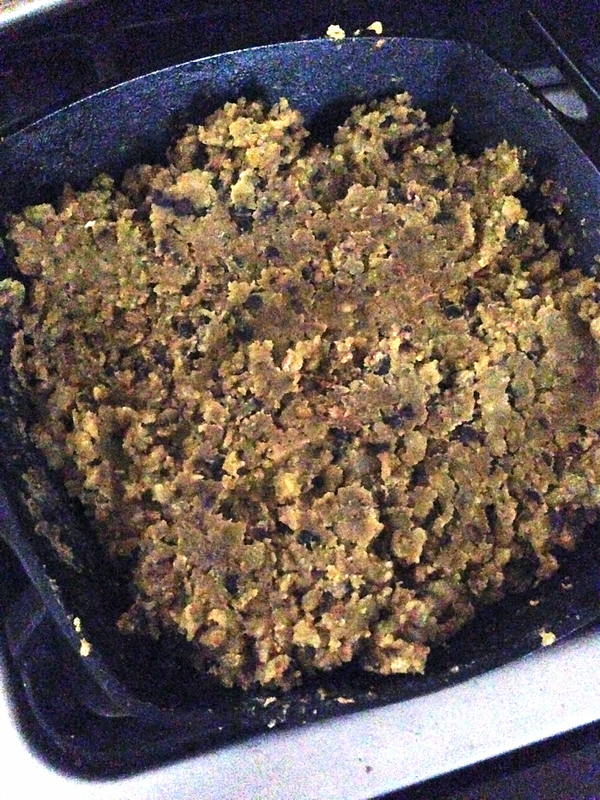 I scraped the mess into a glass baking dish, then I piled on the mashed sweet potatoes and smoothed it to the edges. The recipe reviewers were pretty insistent that you need to spread the potato mix all the way to the edges, so I tried my best. So that cleaned out some fridge space. That makes me happy. Since the twins were still asleep (YAY for naps!) I decided to try and sneak in another recipe-i’ve-wanted-to-try. History behind the recipe: C & I are planning a trip to Montreal. We’ve been trying to plan out a few meals ahead of time, and one place that seems to be on everyone’s wish list is Joe Beef. This week on my Food52.com email blast there was a recipe from the JOE BEEF RESTAURANT! WooHoo! It’s for Lentils – but get THIS – made like BAKED BEANS. You’re supposed to fry some bacon, but since we are out I used some olive oil. Next, you add in an onion, some garlic and sauté for a bit. Dump in the lentils – I didn’t have red on hand. Green is the same, right? Okay, after you dump in the lentils you pour in water, ketchup, maple syrup, oil, cider vinegar, dried mustard, ground pepper, some salt and a bay leaf. Bring to a boil, cover and whack that bad boy into the oven for an hour. So two recipes completed during a nap – and it turns out they were both good! 1 egg yolk ** OH CRAP! I forgot this!! 1 1/2 lbs. ground Lamb **I used some leftover Chicken. 2 Tablespoons all-purpose Flour **I used Whole Wheat. 2 teaspoons freshly chopped Rosemary leaves **Ha ha. Fresh. 1 teaspoon freshly chopped Thyme leaves **Again with the fresh?? 1/2 cup fresh or frozen Corn kernels **I used the kernels off of one cob. Who measures these things? 1/2 cup fresh or frozen English peas **OMITTED. 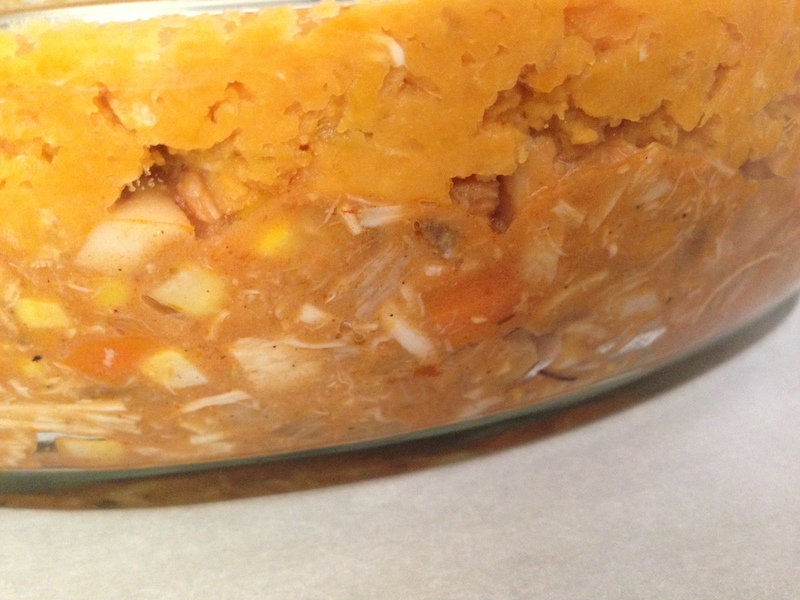 See the Chicken mix below and the Sweet Potato mix above? 1- Peel the potatoes and cut into 1/2-inch dice. Place in a medium saucepan and cover with cold water. Set over high heat, cover and bring to a boil. Once boiling, uncover, decrease the heat to maintain a simmer and cook until tender and easily crushed with tongs, approximately 10 to 15 minutes. **Again, I peeled leftover roasted sweet potatoes. 2- Place the half-and-half and butter into a microwave-safe container and heat in the microwave until warmed through, about 35 seconds. **Ummmmm, I seem to have missed this step. Whoopsies! 3- Drain the potatoes in a colander and then return to the saucepan. Mash the potatoes and then add the half and half, butter, salt and pepper and continue to mash until smooth. Stir in the yolk until well combined. **Okay okay – so I swapped in the unsweetened almond milk, the non-dairy margarine + the non-dairy cream cheese, and I totally BLEW it with the egg. 4- Preheat the oven to 400 degrees F.
5- While the potatoes are cooking, prepare the filling. Place the canola oil into a 12-inch saute pan and set over medium high heat. Once the oil shimmers, add the onion and carrots and saute just until they begin to take on color, approximately 3 to 4 minutes. 6- Add the garlic and stir to combine. 7- Add the lamb (**or CHICKEN), salt and pepper and cook until browned and cooked through, approximately 3 minutes. 8- Sprinkle the meat with the flour and toss to coat, continuing to cook for another minute. 9- Add the tomato paste, chicken broth, Worcestershire, rosemary, thyme, and stir to combine. Bring to a boil, reduce the heat to low, cover and simmer slowly 10 to 12 minutes or until the sauce is thickened slightly. 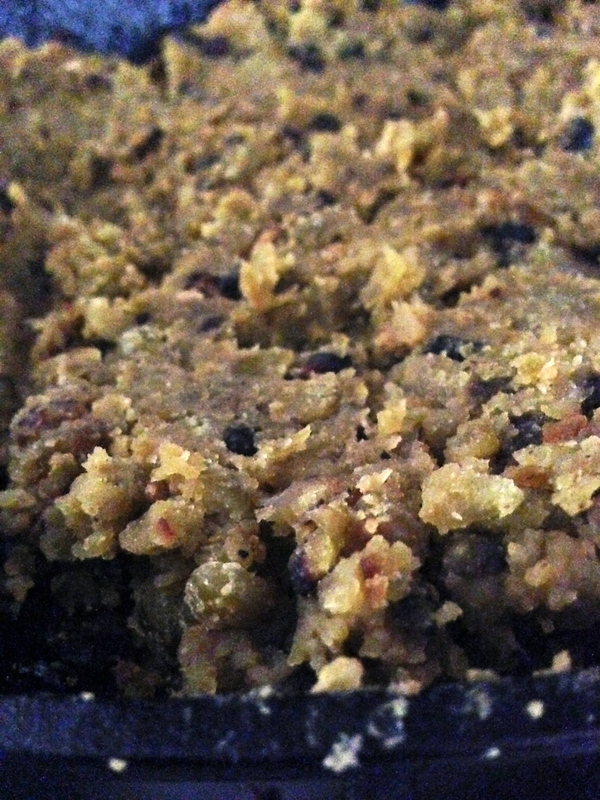 10- Add the corn and peas to the mixture and spread evenly into an 11 by 7-inch glass baking dish. 11- Top with the mashed potatoes, starting around the edges to create a seal to prevent the mixture from bubbling up and smooth with a rubber spatula. Place on a parchment lined half sheet pan on the middle rack of the oven and bake for 25 minutes or just until the potatoes begin to brown. Remove to a cooling rack for at least 15 minutes before serving. 4 slices bacon, finely diced **Yeaaaaaaaah. Used 1T of oil instead. 2 cups red Lentils, picked over and rinsed **Green is a kind of red. No really! It’s true! 1- Preheat the over to 350° F (180° C). In an ovenproof pot with a lid, fry the bacon over medium-high heat until crisp. Add the onion and cook, stirring, for about 4 minutes, or until softened. Then add the garlic and cook for 1 minute longer. **I used Olive Oil instead of bacon drippings. ALSO – I used a cast iron skillet and a sheet pan as a lid. That’s the way I roll. 2- Add the lentils, water, ketchup, maple syrup, oil, vinegar, mustard, pepper, and bay leaf. Stir well and season with salt. Bring to a boil. Cover, place in the oven, and bake for 45 minutes, or until the lentils are tender. 3- Taste and correct the seasoning with salt, pepper, maple syrup, and vinegar. Serve hot now or later. J started the meal by tell me he only ‘yikes yentils’ – which he devoured quite quickly. 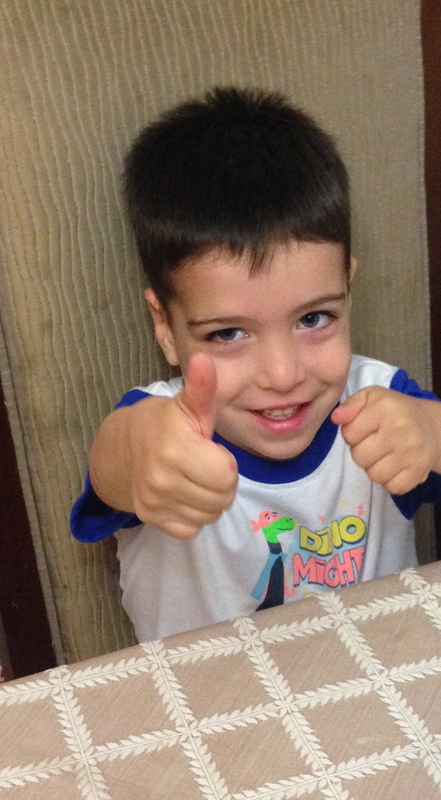 After much cajoling, he finally tried the sweet potatoes – and discovered the corn inside. ‘Hooray!’ he shouted. ‘I YIKE corn!’ He ate two helpings of ‘yentils’. R liked the yentils as well, but the sweet potatoes more. She had seconds of that. I thought it was DELICIOUS too, though I liked the chicken waaaay more than the sweet potatoes. C and I both thought the balance was off. Needed less sweet potato layer or more chicken layer. BTW – this week my son thinks he’s a dinosaur.